Smith and Morehouse Reservoir is in the upper reaches of the Weber River drainage in the western High Uintas. This area of the Uintas is popular during the summer, as it is relatively close to population centers on the Wasatch Front. It is in a narrow, north-facing canyon that stays cooler and moister than other areas. The shoreline is owned by the Wasatch-Cache National Forest, and public access is unrestricted. In addition to recreation water use is for both irrigation and culinary purposes, with a greater fraction being used for culinary as population increases along the Wasatch Front. 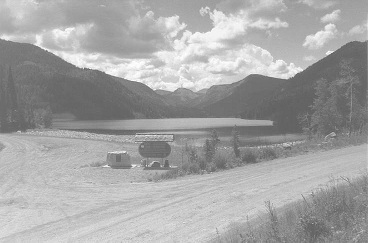 Smith and Morehouse Reservoir is east of Oakley on the paved road that follows the Weber River. The route is well marked from Oakley. Fishing, camping, picnicking, scenic beauty and hiking are all popular. There is a boat ramp, and the reservoir is popular for water recreation, although it is quite cold for swimming.